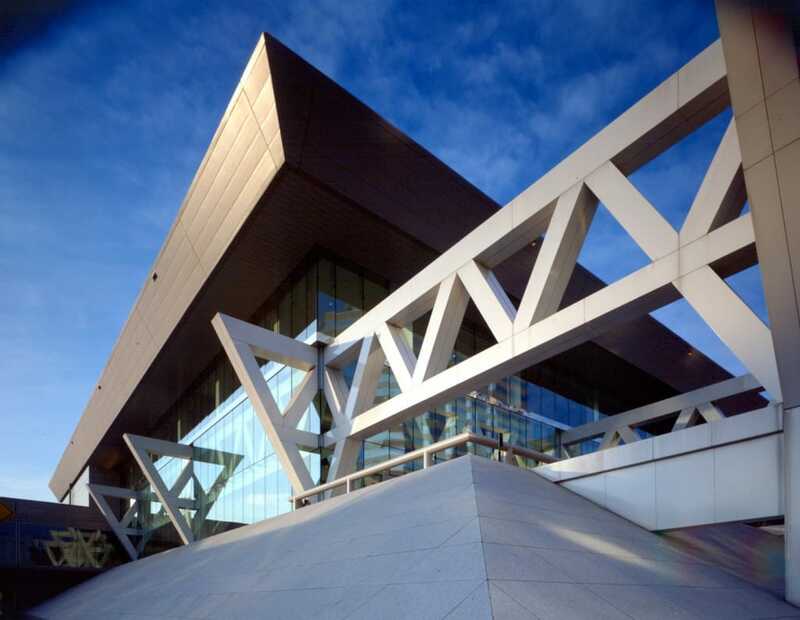 In order to accommodate a wider variety of conventions, the Baltimore Convention Center underwent a major expansion and renovation of the facility. Gilbane stepped in to provide Program Management (CM-Agency) services for this project. Our team successfully took the project through the design and preconstruction phase with the Maryland Stadium Authority and the architect. Our extensive preconstruction effort consisted of design review, estimating, scheduling, value engineering, constructability review and assisting the client with presentations. The project featured a major expansion of the existing convention center totaling 600,000 SF and a partial renovation of 475,000 SF, bringing the total square footage to over 1,000,000 SF. A major part of this undertaking included 16,000 tons of steel that tripled the size of the original building. The new facility includes a below grade exhibit hall, meeting rooms, and a new ballroom, plus accompanying mechanical and public spaces. To avoid any disruption of services, the Gilbane team planned the utility relocation in two phases. Given the tight urban site, this task was no easy feat. Gilbane led the team through six-day, three-shift workdays and managed a workforce that peaked at 700 to meet the schedule. The team met weekly with the center’s staff and field representatives to ensure the center’s daily operations were not compromised. Under strict schedules and open lines of communication, the fast-track addition was completed on time. 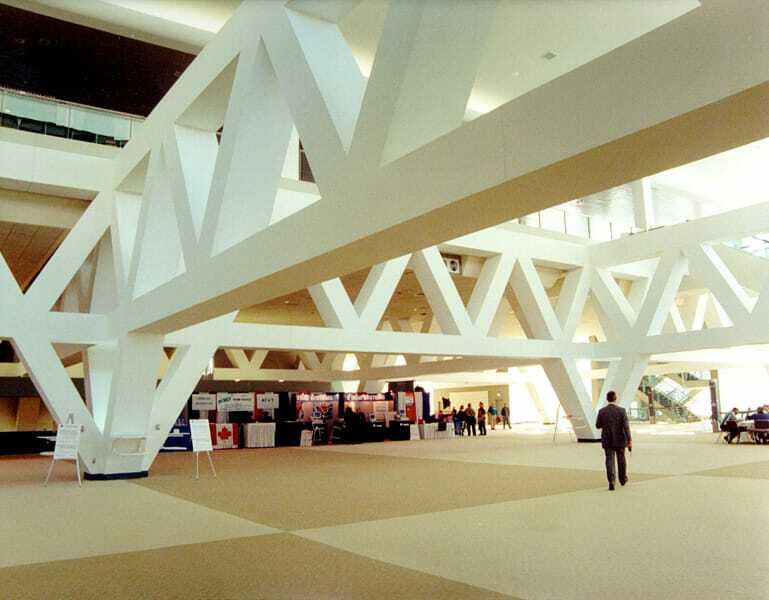 The renovation of the existing center was then undertaken, and the entirety was expanded and renovated before Baltimore Convention Center began hosting conventions once again. Despite the tight site and ongoing Convention Center activities, Gilbane’s planning and communications resulted in this project being delivered on schedule with no adverse effect on utility services in the city and no accidents to any third party, while managing 36 subcontractors and an accelerated schedule. 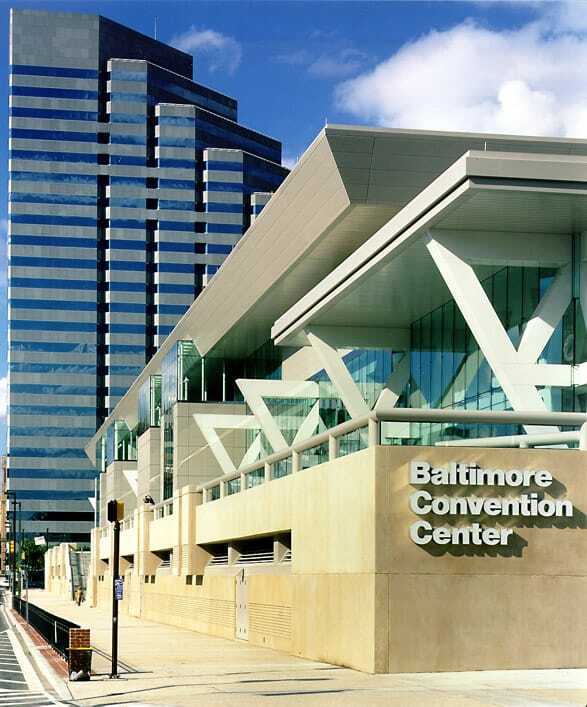 The Baltimore Convention Center was built from sidewalk to sidewalk on the main pedestrian and vehicular boulevard in Downtown Baltimore, directly across the street from the Oriole Park at Camden Yards and adjacent to the oldest Methodist Church in Baltimore. This complex work involved the rerouting of virtually every major Baltimore utility from within the expansion footprint inclusive of a 30 inch water main, a 30 inch gas main, miles of electrical duct bank and fiber optic and storm water and sewage mains. Additionally, this work was performed directly adjacent to an underground Conrail train tunnel and Baltimore’s Light Rail. During the design phase, Gilbane assumed the lead of coordinating Baltimore Gas and Electric, Baltimore City Public Works, Maryland State Highway and Administration, Conrail, Trigen (steam) and countless other involved parties. For the massive relocation of the two 30 inch water and gas mains, Gilbane orchestrated a unique “common excavation” technique that enabled BG&E and Gilbane’s Trade Contractor to accomplish their work simultaneously. Gilbane’s innovative technique saved over $500,000 and more than three months in construction time.